There should always be plenty of room in a civilized society for the airing of grievances and the thrum of good, solid, public discourse. This is something that we should wish for every nation be they friend or foe. Here in America we have a wonderful history of public discourse and peaceful transition as our society advances through the decades of our experiment. There have been disagreements to be certain and we’ve had our share of decidedly uncivilized opposition but on the whole, our nation has maintained a tone of reasonability and decency. I make no attempt at whitewashing the sores or failings of our republic but it is objective fact that we have excelled since our inception in individual freedom while also sharing a joint identity as a republic of unified, sovereign states. There has been no time in our history and there will be no time in our future wherein all parties involved in our nation will agree wholeheartedly or even halfheartedly on any given point, idea, or proposal. There simply isn’t a moment in time that will see mankind as it is reaching full and unequivocal consensus on any given issue. For now, however, it is a “difference of opinion” as they say, “that makes a horse race”. There is much in the angst and maturation of our younger generations that is to be tolerated and even at times appreciated for the natural process that it is. What is not tolerable is the destruction of property or wanton disregard for both private property and public safety. There is a problem with your entire being when you speak of free speech and the rights of man with one side of your mouth then both espouse and cheer acts of destruction and personal violence with the other side of your mouth. There is a fatal, fundamental flaw in an ideology that decries the supposed oppression of one system while happily imposing the flagrant and unforgiving oppression of its own system. In my mind, the most egregious transgression being witnessed today is that which has our youth raging in opposition to a system that permits their wild outbursts and diatribes all while telling us about the evil of that system. The acts of violence and destruction I see in the streets of my great nation are heartbreaking and disquieting. I applaud those who stood in opposition to the Jim Crow Laws and I am proud of the history of my nation that has eradicated slavery within its own borders and actively crusaded to bring peace, prosperity, and freedom to others. I am proud to live in a land where I can espouse my beliefs regardless of how distasteful they may be to others and where I would and others have lain down their lives for the right of others to do the same. I am proud that my nation stands for self-determination and liberty for every man and woman. I am proud that in my republic we do not take your head when you offend our God and we do not stone you to death for personal indiscretion. I am proud that my republic does not permit the execution of homosexuals or the dismembering of thieves. I am proud of all of this and so much more but mostly I am proud that my republic permits me the freedom to live my life according to the dictates of my conscience and allows me the freedom to worship or not worship God as I see fit. I am not obligated to live my life for the gratification or betterment of another and this is something indeed to be proud of. I may be constrained with government programs, taxes, and regulations but these are all things that we can discuss, alter, and deal with in the context and framework of our representative republic. Detesting history is not a productive pursuit and demanding that the nation bow to your personal grievance is not a recipe for a better society. The constant drumbeats of oppression, injustice and inequity are beginning to fall on deaf ears because the eyes, ears, and hearts of the nation are beginning to realize that much of the race and diversity industry is really nothing more than a giant shakedown of our nation for personal profit and the growth of power over the lives of “We the people”. 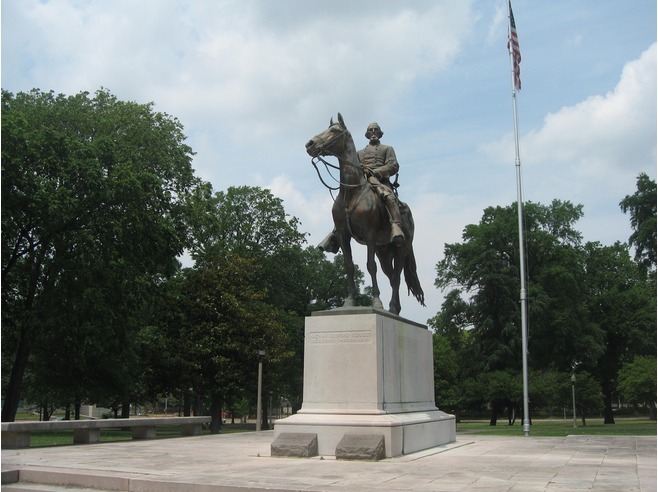 Begin a discussion about the lives and times of men such as Nathan Bedford Forrest. Very importantly, however, you should endeavor to learn from source documents and actual history as opposed to Wikipedia like historical references before you condemn every historical figure. With issues such as slavery, oppression, and bigotry it is incumbent upon us as the descendants of Americans, the keepers of the flame of freedom and the progenitors of the future that we learn all we can of the past so that we and our children may hopefully not continue to repeat the errors of our ancestors. We must not succumb to petty impertinence at the drop of every rumor, assertion, or issuance of propaganda regarding our history. Rather it is important that we learn of history rather than hold forth with impromptu histrionics as a way of displaying our own personal ignorance of what is truth. Use history to teach. Learn from the mistakes of the past and let us each share in the greatness of a nation that encompasses so many differences in our shared unity. Let us never forget that it is not diversity but unity of purpose, a shared heart for the rights of man and a strong reliance on liberty that makes us great. We are strong together because we each share an appreciation for the liberty and freedom of our fellows. Our diversity may make us unique but it does not make us strong. Diversity balkanizes us and makes us petty. When we focus on our diversity rather than accepting our diversity and focusing on our unity of purpose as “Americans” we fail as a republic. When we recognize our diverse backgrounds and views while embracing our shared identity and values as one nation we achieve greatness and no task is too great for us to accomplish. I know that this idea is no longer popular and that is exactly what makes me a dinosaur. The melting pot means that all of our diversity and differences are brought into the pot. We are tested and tried in the flame of adversity and the superfluous is either evaporated or burned away as we unify. What comes forth from the pot is not a conglomeration of ingredients but a wonderful and hearty mixture with a singular purpose and drive that we call American. E Pluribus Unum…From Many One. Let us not reverse that great axiom but rather let us embrace our heritage and put aside our disputes. Take your private life home and lend your heart and soul to the American identity. I may be a dinosaur folks but as I’ve already said and I continue to maintain that’s ok because thinking is for dinosaurs.